Lentils are a staple food for Indian culture, and are a wonderful source of protein. A meal of lentils and rice provides all the amino acids your body needs to function. That is why the staple of beans and rice sustains so many cultures around the world. Here in the United States, we tend to rely on meat as our amino acid (or protein) source. This reliance may have led us down the path of greater amounts of heart disease in comparison to other cultures because the amount of saturated fat in meat. If you currently don't eat beans, you might want to find a way to incorporate them in your diet as a low fat alternative to meat. 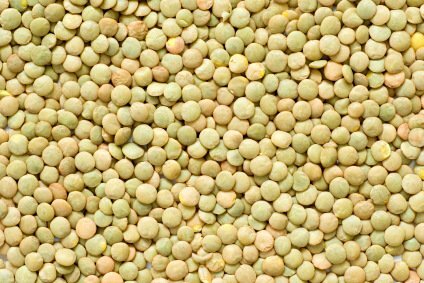 A variety of lentils exist with colors that range from yellow to red-orange to green, brown and black. We will use the easy to find, green lentil. 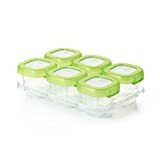 OXO Tot Baby Blocks Freezer Storage Containers, 2 oz - New Color Available! You will find plastic bags of lentils next to the other dried beans in the store. In some stores, you can find pre-cooked lentils in a plastic package. These can be a great time saver! Making lentils can take some time. After you make a big batch, you can freeze small amounts for the future. If you don't want to waste time just cooking lentils for baby - serve her Coconut Dal (this weeks adult recipe). She will probably love it! First put in sieve and inspect for damaged lentils or stones. Then rinse until the water runs through and comes out clear. Put lentils in a large pot and cover with water. Bring to a boil and then reduce heat until it the lentils simmer steadily, but not violently. Cook, stirring occasionally, until lentils are soft 40-60 minutes. Store in cupboard for 6 months. Yes if you can find them. This is a basic lentil recipe and you can always keep the ingredients in the cupboard for an easy meal. This recipe is adapted from Mark Bittman's, "How to Cook Everything". First put lentils in sieve and inspect for damaged lentils or stones. Then rinse until the water runs through and comes out clear. Combine all ingredients except salt and pepper in a large pot with water to cover. Bring to boil over high heat and then adjust to a simmer. Cook, stirring occasionally, until the lentils are soft (40-60 minutes).